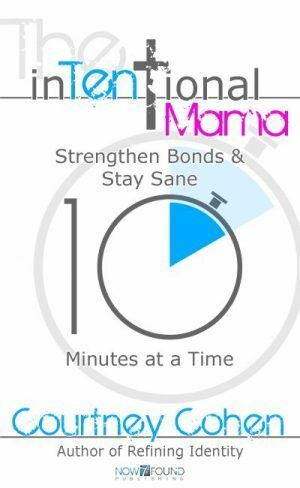 Are You An inTENtional Mama? Are you inTENtional in your relationships with your children? Beneath the weight of living and day-to-day responsibilities, it’s so easy to stay in survival mode. We think it’s too hard…we aren’t doing enough…WE aren’t enough. What I was doing was being semi-present ALL of the time, hounded by mama-guilt that I wasn’t doing enough. But then, God showed me how to apply ten minutes at a time with inTENtionality. I realized how powerful 10 minutes can be in helping me be fully present to my children some of the time, which is far better than only being semi-present all of the time. There are meals to cook and laundry to do and work to accomplish and urgent tasks that require attention. And kids can enjoy time playing on their own or with siblings or friends. But I can know now that when I’m with my kids, I can have inTENtional times where I’m truly with them! My latest book dives into very practical detail as to how to be inTENtional with 10 minutes. Currently, it is available for FREE downloads to all subscribers to Now Found Ministries. (Once you subscribe, you will receive an email with your access code.) The inTENtional Mama is available for Kindle, iBooks, and Google Play. I pray this is a resource that you will find a very practical blessing in your relationship with your child! Be the amazing mama you are! Be inTENtional!